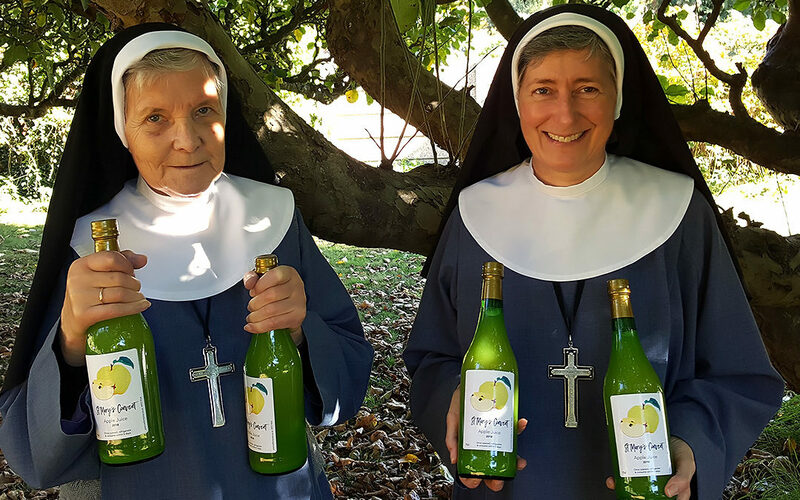 For the first time, apple juice produced from the orchards of St Mary’s Convent, Wantage has been produced and has gone on sale. The apple crop, harvested by the gardening Team from the grounds of the Victorian convent, have produced nearly 400 bottles of natural apple juice. Pressed and bottled at a specialist farm in Oxfordshire, the unique juice is now available both at the Convent and at the specialist delicatessen Grocer Chef in nearby Ardington. “The extensive orchards were planted when the number of Sisters at the Convent numbered nearer 200. Today, we just don’t need so much fruit, “ says Sister Stella, the Sister in Charge. “So it’s right that we harvest the fruit and use it productively. And the juice is delicious,” she says. The 75ml bottles are on sale for £2.99. The 395 bottles of the 2018 vintage is expected to sell out quickly.